Marshmallow is currently running on 1.2% of devices, which really ought to be higher by now. 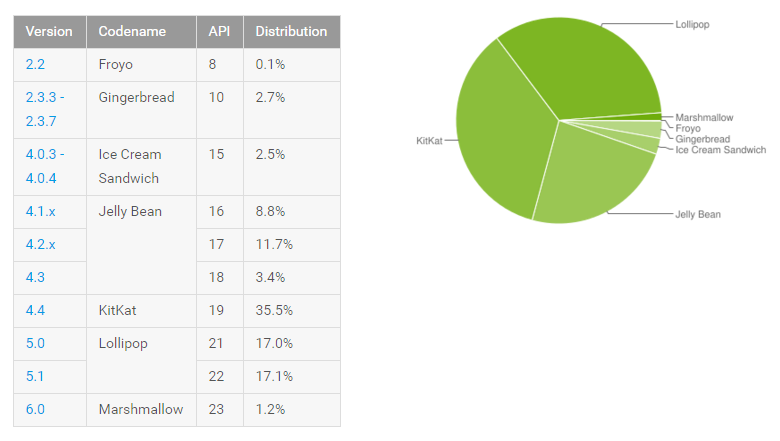 Lollipop didn't show up until the February 2015 numbers, but when it did, it was at 1.6%. So despite a faster start, Marshmallow adoption is now tracking behind that of Lollipop. Also, Lollipop is still moving up right now, and plenty of phones still ship with it. As for Froyo, it has been at 0.2% of devices since last summer, but now it's on the verge of falling off the charts. Anything below 0.1% isn't reported by Google. Froyo is almost dead, just give it a few months.